Anyways, glad to have you and please stop by and check out my recent posts! And by master bedroom, what I really mean is a twelve-year-old boy's room. Complete with navy blue walls, smelly laundry, and BB gun holes in the walls. Yes, I said BB gun holes in the walls. Don't believe me? 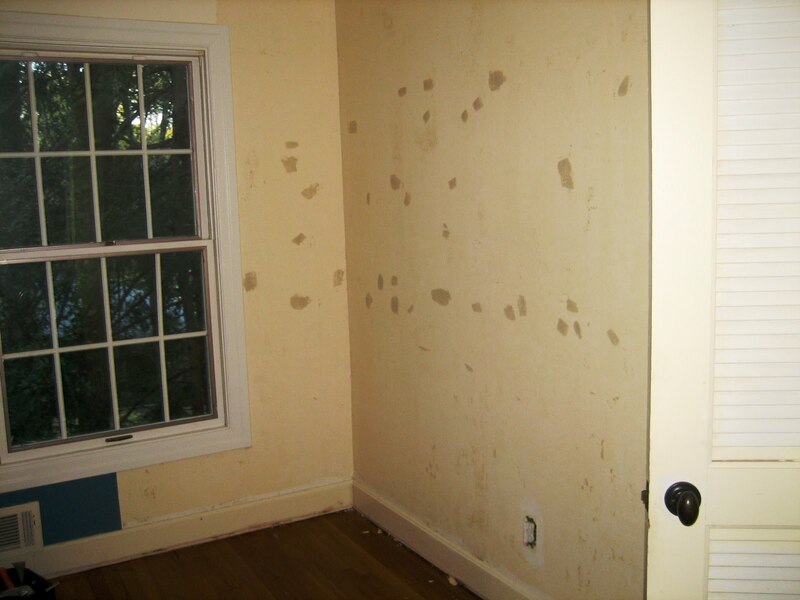 Each one of those Spackle marks? A BB gun hole. And that's just one wall. (Yes, we can all cringe together!) Oh! And don't forget the fifty years of wallpaper found underneath the navy blue. Oh! And that was only found once we ripped what felt like billions of feet of impossible to pull off chair rail. Those poor walls got so beat up! Yes, ouch. Like I said, that took lots of Spackle. And one rockin husband who stayed up till 2 am several nights in a row to get this done. Well, I think he had some incentive, as we were sleeping on an air mattress in the guest room. That would be said air mattress. Okay, so on to the "later!" First of all, I just want to say that I'm completely aware that we have a really, really small master bedroom. Even still, we are honestly loving it! In order to be comfortable, we just had to pare it down to the basics. Actually, Goodwill is loving us because we weeded out and donated our old bedroom TV and a bunch of unnecessary old clothes. It feels good to keep it simple! There are actually other bedrooms in the house that are larger than our bedroom, but this room is in the back of the house with a bit more privacy and is the only room in the house that has a bathroom attached (check out our before/after page for the gruesome pre-renovation bathroom pictures). Anyways, after repairing the oh-so-sad walls, our next big step (of course) was paint. 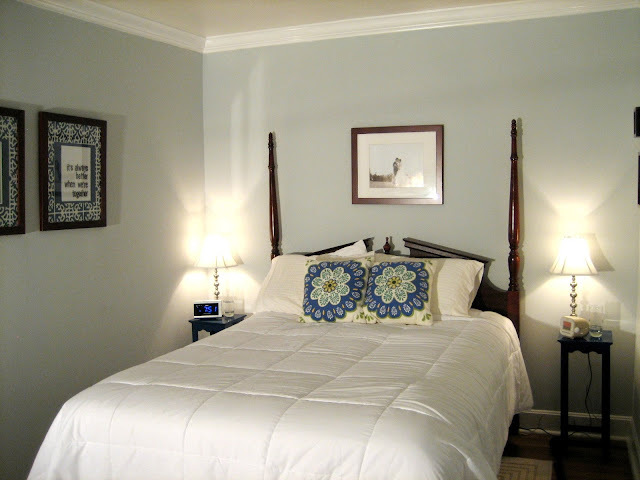 We added several coats of Benjamin Moore's Pale Smoke, which gave us the relaxed, soothing color we were looking for. We went back and forth about what colors to use as accents in the room (we attempted a raspberry red, a dark gray, and even a golden yellow) and ended up with royal blue-- against neutrals of course! 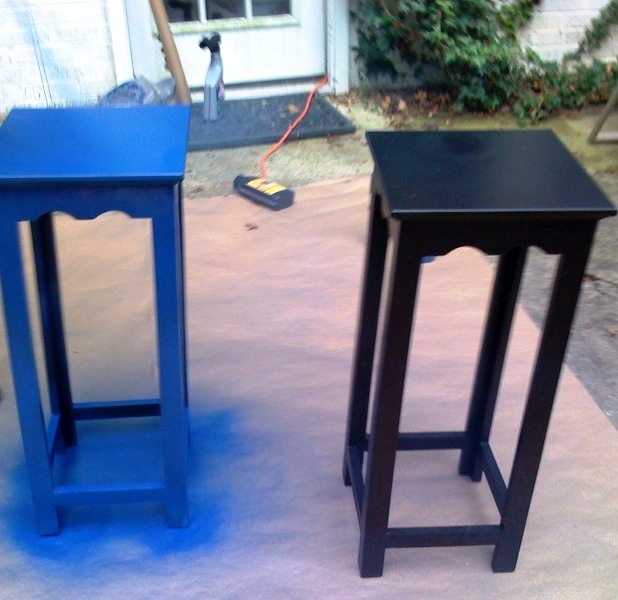 I decided to pull in the royal blue in some funky ways: curtains, our night stands, throw pillows, and picture frames. I love me some royal blue! Ok so lets be honest... I might have gone a little overboard on the blue spray paint. Lets just say David likes to call it attack of the Smurf. Smurf got the Hobby Lobby nightstands. The white Walmart frames (complete with some of our favorite wedding pictures) also got Smurfed. And of course we had to pull in the blue treatment with some fun Target pillows. This is actually the bedding from our old house- we haven't found anything new we like, so we've yet to move on. And yes, that is our favorite, favorite wedding picture above our bed, courtesy of the a-maz-ing Lindsey Turner of Lindsey Turner Photography. Here are some daytime pics of the space. 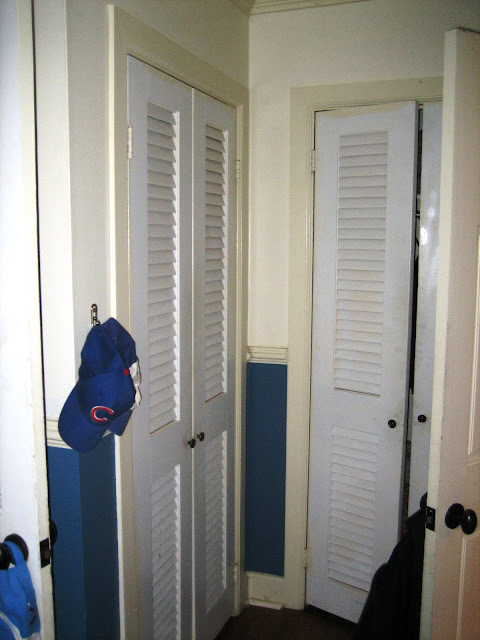 There was a big question about what to do with the cluster mess of doors otherwise known as the closet and bedroom doors. There just wasn't much flow once you opened all of the doors in that tiny space. So we pulled each door out and added some flow... with curtains! I bought several yards of (royal blue accented) fabric from Jo-Anns and simply cleaned up the edges with some no-sew hem tape. You thought I would sew?! I may be crafty, but I'm not that good! :) When I "sew," I use extra strength Heat 'n Bond! 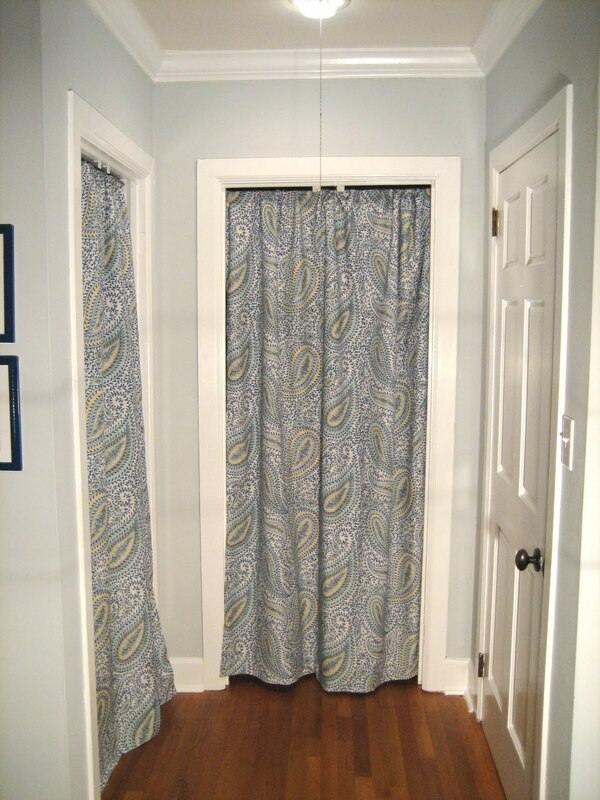 Then I just slipped the top of the curtain onto a tension curtain rod. Voila! Curtains! Oh, and speaking of, I pulled an even easier Heat 'n Bond curtain trick on our window treatments. 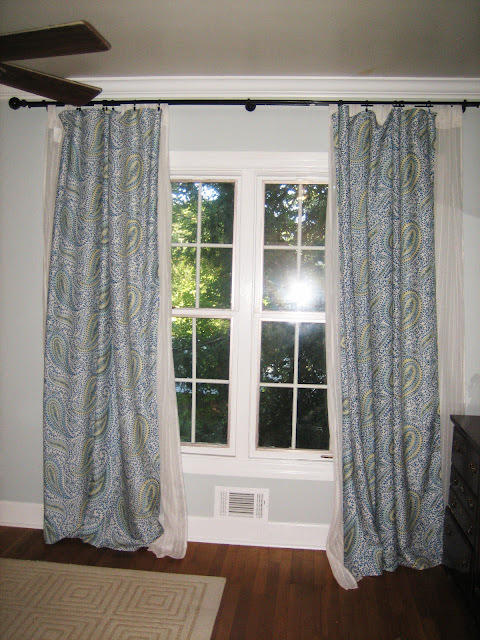 Instead of the tension curtain rod, we just bought curtain clips and hung the fabric from the curtain rod like so. Add in a neutral rug from the one and only Target and our matching hand-me-down dresser (thanks Aunt Christy! ), and we've got our perfect master bedroom! Well, let's be honest. Not incredibly perfect. And no, I'm not talking about the yellow tiled adjoining bathroom. 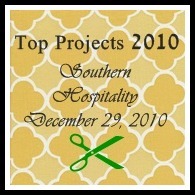 A little something has been irking us since we finished our master bedroom redo. In fact, we're currently undergoing a mini-makeover in this room as we speak. Already?! Yes. :) Stay tuned! 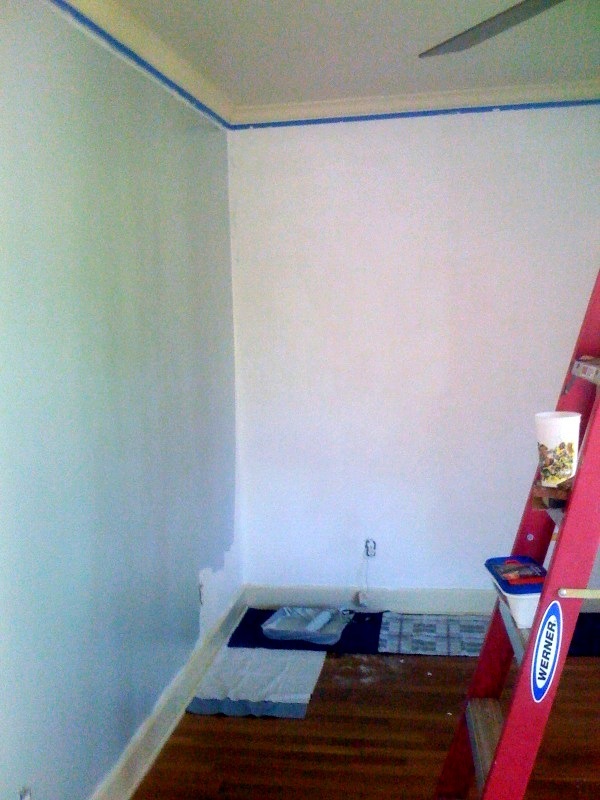 **Note: Pictures have been updated to show the trim paint makeover shown here. Yay fresh white paint! 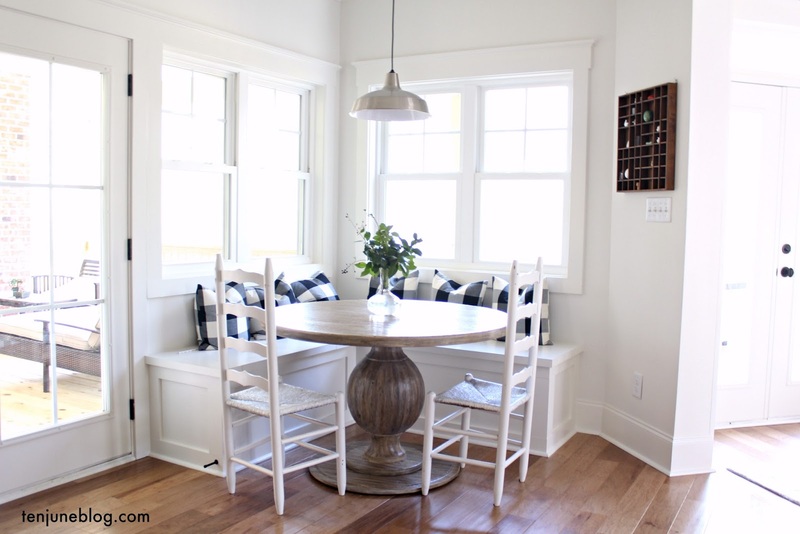 Check out our house tour for more pictures of the whole house in before/after mode! Oo I'm going to guess that you're taking the trim from a beige to a bright white! I love it-- we have the same name and the same taste!! :) Pictures soon to come!! What a cute home. Thanks for sharing the photos. I appreciate you visiting my blog & leaving a comment so that I could find your great blog. I've enjoyed my visit! It's a beautiful room! I love that fabric, and using it on the closet door is a huge improvement over the doors that were there. Love your transformation. It is so beautiful and serene now. I have the same Target pillows on our porch. Absolutely love them! Congratulations on your CSI win!! Have a fun weekend! such a soothing space, and gorgeous color! Simply gorgeous!!! I can relate we bought the smallest house in our neighborhood and our closets are tini-tiny but I'm going to reshape them again! You did such a beautiful job! Love that fabric! I think I'm going to use that idea on some rooms in my house! I love the transformation! It is gorgeous! I would like to post a picture of it on my blog with a link back to yours if you are ok with that! We're trying to decide on colours for our bedroom, yours is definitely making me want this colour! What is name of that paisley fabric? I just adore it! Just beautiful--so refreshing to see how you transformed a normal size bedroom from boycave to oasis!